Winning Smiles Dental Surgery | Blacktown | Denham Court > Winning Smile Blog > When you required an emergency dentist? Dental pains are considered one of the most painful after heart pains. Also, teeth are required by every living being to break down food into smaller parts for easy digestion. Biologically said, if you cannot use your teeth for eating, your digestion system faces a lot of duress. So, it is advisable that you take due care of your oral health. This being said, you cannot avert dental emergencies. You may get sudden pangs of a toothache in the middle of the night or you may meet with an accident and get an injury in the mouth. During such situations, you need an emergency dentist whom you can consult and who would help you ease the pain as soon as possible. But it is not at all a hidden fact that dental services are extremely costly. So, for a middle-class family, an emergency dentist consultation can burn a hold in the pocket. So, you need to plan beforehand before any family member faces an emergency dental issue. You need to look for an affordable emergency dentist who can come to your aid at the time of the need. To be sure that you receive excellent treatment, you need to search for an affordable emergency dentist right after you move into a town. Look for a dentist who can offer regular dental check-ups and has your family dental records so that in the time of history, diagnosis is possible quickly. When you plan to look for such an affordable dentist, you need to make sure that you are not signing up for inefficient dental services in the course of saving money. To ensure that you have a skilled yet affordable dentist to serve you in the wake of any dental emergency. Before you start looking for an emergency dentist, make sure that you do not start looking around randomly. There is a local dentist society in every Australian state which has a list of dentists accredited by the Australian government. They also have a list of dentists offering services at affordable rates. You can also ask your family physician to recommend you a dentist. A physician is a member of the doctors’ association and also knows several professionals from his field. He or she would be able to point you in the right direction. Of course, you can also ask family, colleagues, and friends to pitch in suggestions. If you are moving out of town, it would be a good idea to ask your dentist to suggest a dentist in the town you are moving to. While looking for an affordable emergency dentist, you need to be extra careful. You cannot compromise the quality of the treatments for affordability. So, make sure you ask enough questions about the qualifications of the dentist and the number of years of experience. When you trust someone to operate within your mouth, you first need to trust that person completely. Also, take a walk into the dental clinic of the affordable emergency dentist that you are planning to choose to find out whether the surroundings are amicable enough. Make sure that you inquire about the emergency services offered by the dentist and the extra charges for emergency services charged if any. At last, ask a few questions related to dentistry to the dentist and see if the way he or she explains those things to you is understandable or not. You need to have a certain level of compatibility with the dentist to be able to consult him or her in the event of emergencies. If you require emergency dental care after hour’s dentist, including evenings, Saturday and Sunday, and holidays, care is provided by Winning Smile Dental Surgery at Blacktown and Denham Court. 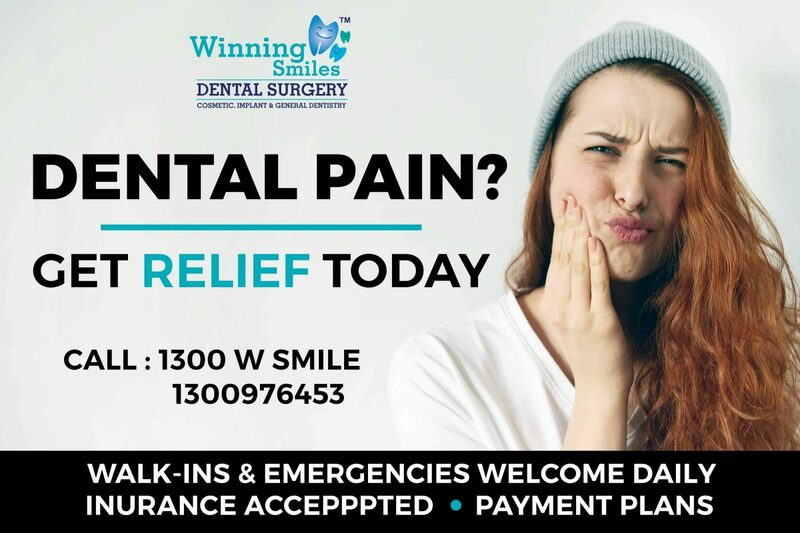 If you have a problem that is not an emergency dentist, or a scheduling conflict, please contact Winning smiles Dental Surgery during normal business hours at 02 9622 33 33.